Radnor has had a surprising ascent to the top of the local football landscape. For years, Radnor would be on the other end of scores like 42-8 and 63-21. For years, the Red Raiders were often the team other Central League teams hosted for homecoming. But gradually, Tom Ryan has chipped away at that reputation. The Radnor head coach has made football relevant the last 12 years, and this season, the Red Raiders are enjoying the kind of success that they haven’t had in literally decades. Now, the Red Raiders are the ones one the plus sides of blowouts. They’ve qualified for the PIAA District 1 5A playoffs for the third-straight season and at 6-1 are the No. 1 ranked team in the PIAA District 1 5A. Radnor, one of the smaller schools in the Central League known more as a soccer, lacrosse, field hockey power, hasn’t had this kind of success since 1976, the last time the Red Raiders won the Central League title with an 11-0 record. The last time the Red Raiders beat traditional powerhouse Ridley was in 1999—and that 19-year streak ended abruptly with Radnor’s shocking 63-21 blowout of the Green Raiders on Sept. 14. Tonight, the Red Raiders face another powerhouse, undefeated 7-0 Garnet Valley, at 7 p.m. at Radnor. In the past, the game would be over before it started. Not with this year’s Radnor team—especially not with this team’s seniors. Ryan, though not wanting to take any credit, has cultivated a winning environment for the Red Raiders. Senior tailback Matt Cohen has 944 yards rushing in seven games, senior quarterback Sean Mullarkey is the most efficient passer in Delaware County, and massive 6-foot-6, 280-pound two-way lineman Anthony Laudicina, who’s headed to Buffalo on a full scholarship, and 6-foot, 245-pound senior center Henry Collins, moves everyone out of their way. Dylan VanDusen, a 6-foot-4 senior kicker, is headed to Lehigh and is 26-for-26 on extra points and 3 of 5 on field goals. “It’s a special group of seniors who’ve been playing together since grade school,” Ryan said. “We knew we had a ton of seniors back with varsity experience, so we had an idea would might have some success. Our philosophy the last few years has been to make the district playoffs. “This is the best team I’ve had record-wise in my 12 years here. This is a huge test for us against Garnet Valley [Friday night]. Coach [Mike] Ricci does a great job over there, and they always have a great team. I have six Radnor grads on my staff, and guys like Dave Bowen, who starred at Boston College, has come back to coach our offensive line and is our run coordinator. “Larry DiSipio has come back to be our offensive coordinator. We’ve had good talent here, but these kids, these seniors, deserve all of the credit. They’re the ones that have made everything happen. Not one of my players or captains talk about looking ahead at the playoffs. Their attitude is who’s next. Radnor has beaten Marple Newtown, at Marple Newtown, in double overtime, District 1 5A finalist Springfield, at Springfield, and Ridley. 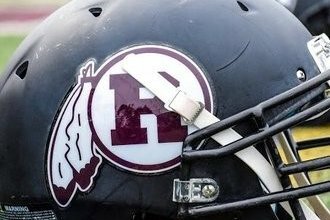 Radnor has never hosted a PIAA District 1 5A playoff game nor won a PIAA District 1 5A playoff game—yet. Seven weeks into the season, North Penn still remains No. 1 in the PIAA District 1 6A rankings with an average of 172 points, followed now by Coatesville (161), which jumped from No. 2 from No. 4, bumping down Garnet Valley (158), Downingtown East (151) and Downingtown West (148), which fell after its biting 42-14 loss to Coatesville last week. In 5A, Radnor is the new No. 1 at 6-1 after its 35-23 victory over Springfield (Delco), which fell from No. 2 to No. 5. Upper Dublin (160) rose from No. 4 to No. 2, while Penn Wood (158) fell from No. 1 to No. 3. Academy Park (152) moves from No. 5 to No. 4 and Springfield (145) rounds out the top five in 5A. Undefeated Pottsgrove remains No. 1 in 4A and unbeaten Conwell-Egan continues to top 3A. Under consideration: Academy Park 6-1, Penn Wood 6-1, Radnor 6-1, Haverford High 6-1, Springfield (Delco) 5-2, Spring-Ford 6-1, Council Rock South 5-2, Archbishop Ryan 6-1, Germantown Academy 5-0, Pottsgrove 7-0.